Home of one of the most important Jewish commu- nities of Italy, the Adriatic seaport of Ancona was a leading center of ketubbah illustration. Distinctive types of richly decorated ketubbot developed locally. 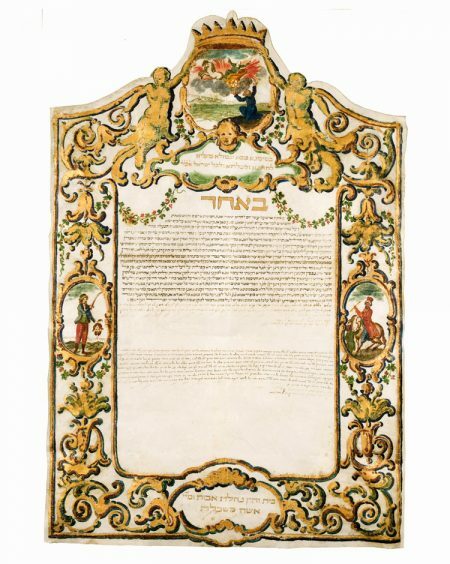 In fact, the prominent Jewish families of Ancona invested so much effort and money in commissioning sumptuous ketubbot for the weddings of their offspring that community authorities were forced to limit the amount that could be spent on the decoration of the contract. This large piece of parchment is decoratively trimmed at the top. Its captivating border, highlight- ed by designs in strikingly bright tones of gold and green, closely follows popular frames of the time. Within the colorful floral and ornamental patterns that frame the text are three vibrant biblical episodes. Supported by a pair of classical hybrid figures at top center, the main episode depicts the prophet Elijah ascending to heaven, riding in his fiery horse-drawn chariot, while his amazed disciple, Elisha, watches below. The identification of the scene is confirmed by a biblical quote from II Kings 2:11. Typical of Italian ketubbot, the depiction of biblical heroes in their finest hour alludes to the names of the bridal couple. This scene thus refers to the bridegroom’s first name, as Elia is a variant of Elijah. This identification is reinforced by the crown above, alluding to the “crown of the good name” of the groom. The other two biblical episodes appear in the cartouches at the center of each of the side borders. At right, the scene of the Triumph of Mordecai, inscribed with the text of Esther 6:11, refers to the second name of the bridegroom, Mordecai. Depicted at left is another triumph – that of David over Goliath, accompanied by a quote from I Samuel 18:14. As no biblical figure bears the bride’s name, Tova, the selected scene refers not to her, but to her father, David Camerino.